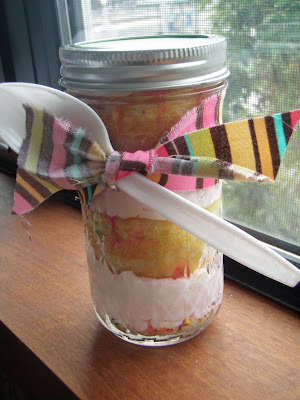 My friend Kelly, my other training partner, dropped off this cupcake in a jar for me the other night. She made these as gifts for her son's pre-school staff. Super cute and very easy to make. She used Funfetti cake mix for the cupcakes and whipped up her own frosting. She then used a concept that I blogged about a few months ago. Cupcake, frosting, cupcake, frosting, cupcake, frosting. Add a bow and spoon and the gift is complete. The addition of a spoon is such a cute idea, but then again, she is such a creative lady. Great idea. I think I will do this for my son's teacher as well. Love the website lots of great ideas and info.